With Spring just around the corner, I couldn't be happier to get rid of the short, cold days of Winter. To be able to take pictures outside without losing feeling in your fingers. Smiling without your lips trembling into some awkward grimace (my excuse for not smiling...sorry for my grumpy face)! Having a normal colored nose instead of a red Rudolph-like one. Losing the pale, blotchy-ness that takes over once the summer tan has faded away. Wearing skirts with bare legs and not knocking your knees together like a crazy woman. It may look all nice and sunny here but let me tell you looks can be deceiving. All of these things and more make Winter less ideal for a fashion blogger. But with Spring comes Summer, and with Summer comes sweaty feet, frizzy hair, and simpler outfits. Layering is not an option in the blazing heat of an east coast August. There are downsides to every season, of course. But rather than look at the downsides, I'm going to focus on the ups. And Spring is packed with them! It's safe to say that I'm SO ready for Spring! I love this outfit! 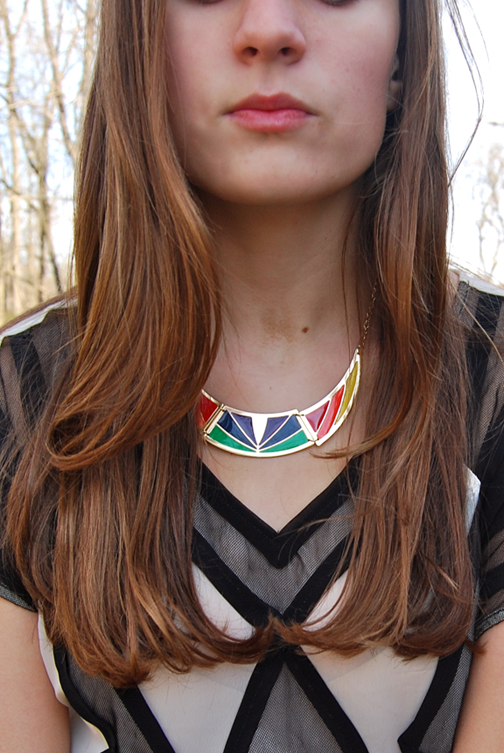 The geometric pattern looks great on you, especially with that gorgeous necklace! OMGGGG Rory amazing Necklace and super chic Skirt. Your skin is soo clear! I am jealous! This was nicely put together! I have a Kate Spade giveaway, come ovah! Love love love your top! Very cool and versatile! Rory this outfit is amazing. you look so put together and fun! love the printed skirt! so fun and what a great color! i am just waiting until i no longer have to wear tights!!! you look lovely, despite tge cold. i love the pattern mixing in this outfit! haha absolutely agree spring and summer are so much better for photos :) and thanks for your sweet comment! i'm holding a giveaway for the tights next week! Gorgeous outfit.. We like your style in here... so pretty! That skirt looks so pretty, I love the colours! beautiful style, like the skirt! Well done! 1. I love Glee now, my best friend got me into it. And that song was also a favorite (Jessie's Girl) and Finn's version is amazing as well! I just wanted to pop by and compliment you on your legs - gorgeoussssssssss! So jealous of your warm weather! I hoping it will warm up around here soon! What a great necklace, love the rainbow colours, I cant wait to be able to do more outdoors photos! You look supper cute, the top is amazing. i love this top!! it is so unique and fun! i like how you paired it with that skirt! lovely necklace! very bright and colorful! I love that shade of pink on you <3 and the necklace is truly amazing! Awesome top. Love how you paired it with that bright, patterned skirt. i don't actually take any pics of myself, i rarely do that. and i mainly blog about fashion editorials but since i style and take pics for my best friend's blog i know what you mean about freezing to death while being outside, and then when you wish for summer to come and it actually comes its not as great as it seemed back in winter..